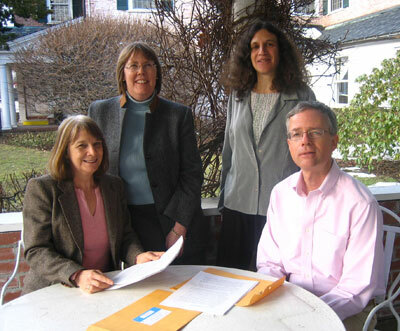 That's me on the left, with Jeannine Atkins, D. Dina Friedman, and Bruce Carson. When the idea of becoming a writer first occurred to me, I envisioned a lonely life. Early in my career, the process was solitary and somewhat claustrophobic because I had no one to talk to about my goals, obstacles, technical problems, and the solutions I was beginning to arrive at through trial and error. After I found others to discuss these concerns with, not only did the process became less lonely, but also the writing itself began to take off. So I'm a believer in writing groups. It all depends on linking up with the right people. I was lucky to find Jeannine Atkins, Bruce Carson, and D. Dina Friedman, oh, it's going on fifteen years now. We were all at a meeting of the Western New England chapter of the National Writers Union. Bruce passed around a sign-up sheet for people interested in starting a manuscript group. The membership changed over the course of the years, until it finally settled down to the four of us and we decided to close the group. When we first started none of us had published a novel, although all of us had finished writing at least one. Over the years, we've proved that persistence does pay off. Jeanine published first. I'll never forget the day she told us she'd been offered a contract for Aani and the Tree Huggers, a beautiful picture book about local people in India who save their forest from developers. I admit I wondered whether the four of us could handle having one of us attain the "holy grail" while the others still struggled. The fact that we did manage to overcome any envy is a testament to our generous personalities plus the benefits that we all draw from our bond. Jeannine has gone on to publish many more children's books. Read about her many accomplishments, along with an excerpt from How High Can We Climb, her recent chapter book about women adventurers and explorers, published by Farrar, Straus. A few years later, I was the lucky one, when my mystery, Exiles on Main Street, was bought by HarperCollins. The phone call I received while in Key West, researching my treasure novel, will remain indelibly imprinted in my mind as the happiest moment of my life. In 2006, Dina became the third to attain the impossible dream. With two young-adult chapter books published within a few months of each other—Escaping into the Night and Playing Dad's Song, she broke through with a bang. Read about Dina and sample Playing Dad's Song, published last fall by Farrar, Straus. Bruce has found an agent for his thrilling historical saga Bloody Kansas. It's set in the years leading up to the Civil War, when abolitionists, slaveholders, and pioneers were battling over whether Kansas would be a free state or slave. The vivid cast includes blacks and whites, free and slave, fugitives and pursuers, all focused on getting to Kansas in order to influence the vote. Their quest culminates in a spine-tingling depiction of the Lawrence Massacre. Read more about Bruce, along with the opening paragraphs. Find out how you can start your own manuscript group.